Ficus religiosa or sacred fig is a species of fig native to the Indian subcontinent and Indochina that belongs to Moraceae, the fig or mulberry family. It is also known as the bodhi tree, pippala tree, peepul tree, peepal tree or ashwattha tree (in India and Nepal). The sacred fig is considered to have a religious significance in three major religions that originated on the Indian subcontinent, Buddhism, Hinduism and Jainism. It is the type of tree under which Gautama Buddha is believed to have attained enlightenment, and Hindu and Jain ascetics also consider the tree to be sacred and often meditate under them. Ficus religiosa is a large dry season-deciduous or semi-evergreen tree up to 30 metres (98 ft) tall and with a trunk diameter of up to 3 metres (9.8 ft). The leaves are cordate in shape with a distinctive extended drip tip; they are 10–17 centimetres (3.9–6.7 in) long and 8–12 centimetres (3.1–4.7 in) broad, with a 6–10 centimetres (2.4–3.9 in) petiole. The fruits are small figs 1–1.5 centimetres (0.39–0.59 in) in diameter, green ripening to purple. F. religiosa is a tree having a very long lifespan, with an average life ranging between 900–1,500 years. At some of its native habitats, it has been reportedly found living for over 3,000 years. Some trees have been reported to be more than 2,000 years old, like the Jaya Sri Maha Bodhi, a peepal tree in the ancient city of Anuradhapura in Sri Lanka which is estimated to be more than 2,250 years old and is regarded as the "Oldest historical tree in the world with religious importance". Banyans have different male and female trees. Ficus religiosa is native to tropical Asia, but it has now been introduced, spread and cultivated around much of the world, and in some cases it has become naturalized where its specialist pollinator wasp (Blastophaga quadriceps) has also been introduced. Ficus religiosa is a species native to the Indian subcontinent and South-East Asian countries such as Bangladesh, Bhutan, China (Yunnan province), India (all states except Andaman and Nicobar Islands), Laos , Nepal, Pakistan, Thailand and Vietnam. It was initially introduced to Sri Lanka in 288 BCE and later to other neighbouring Asian countries like Philippines and Singapore. In Philippines, it was introduced at an early date and now has become widespread throughout the country. Sacred Fig was unintentionally introduced to Israel because of horticulture practices and its associated pollinator wasp was also present in the country by the 1960s, which led to its widespread distribution. In Africa, F. religiosa is a native species of Chad. It is distributed in Egypt and Madagascar where it is cultivated, and Libya where it was introduced and now cultivated. In North America, F. religiosa is distributed only in Mexico and 3 states of the United States where it is cultivated. California, Florida and Hawaii are the only states to have a known distribution of the species. In Central America and Caribbean, the species is distributed in Costa Rica, Cuba, Dominican Republic, Haiti, Jamaica, Nicaragua, Panama, Puerto Rico. It was most probably brought to these countries from Indian subcontinent in late 19th or early 20th century during the British Empire. In Nicaragua and Panama, it is only found in cultivation. In South America, the species is distributed in Colombia, Paraguay and Venezuela. In Colombia, it is only found in cultivation while in Paraguay, it is cultivated as well as also occurring in forests at lower altitudes. In Oceania, the species is distributed in the Australian state of New South Wales where it has been naturalised after regional distribution, Fiji where it is cultivated, Mariana Islands (Guam), Northern Mariana Islands (Tinian Is.) and New Caledonia. Ficus religiosa suitably grows at altitudes ranging from 10 metres (33 ft) up to 1,520 metres (4,990 ft). Due to the climatic conditions which are prevalent throughout different heat zones, it can grow at latitudes ranging from 30°N to 5°S. It can tolerate air temperatures ranging between 0 °C (32 °F) to 35 °C (95 °F), beyond this upper limit its growth diminishes. It grows on a wide variety of soils but preferably needs deep, alluvial sandy loam with good drainage. It is also found on shallow soils including rock crevices. Ficus religiosa is associated with Blastophaga quadriceps, an agaonid wasp which acts as its pollinator as this wasp lays its eggs only on trees of this species. Ficus religiosa is tolerant to various climate zones (Köppen climate classification categories of Af, Am, Aw/As, Cfa, Cwa and Csa) and various types of soils. In Paraguay the tree species occurs in forests at lower elevations, and in China the species has been reported growing at altitudes ranging from 400 metres (1,300 ft) to 700 metres (2,300 ft). In India, being a native species, it occurs both naturally in wild as well as cultivated up to altitudes of 1,520 metres (4,990 ft). Ficus religiosa is tolerant to widely varying climatic conditions such as Tropical rainforest climate where the region receives more than 60 millimetres (6.0 cm) of precipitation per month, Tropical monsoon climate where average precipitation ranges from 60 millimetres (6.0 cm) in the driest month to 100 millimetres (10 cm), Tropical savanna climate with dry summer where average precipitation ranges from 60 millimetres (6.0 cm) per month in summers to 100 millimetres (10 cm) per month in winters, Warm temperate climate, wet all year where average temperature ranges from 0 °C (32 °F) to 10 °C (50 °F) and it is wet all year, as well as Warm temperate climate with dry summer where average temperature ranges from 0 °C (32 °F) to 10 °C (50 °F) and summers are dry. 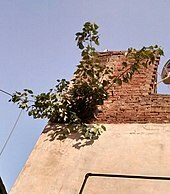 A young tree growing on a concrete wall in Delhi. It is tolerant to wide variety of soils, and hence it even thrives on concrete walls having little moisture. Ficus religiosa has been listed as an "environmental weed" or "naturalised weed" by the Global Compendium of Weeds (Randall, 2012). It has been assigned an invasiveness high risk score of 7 in a risk assessment prepared for the species' invasiveness in Hawaii by PIER. Such a high score predicts it will become a major pest in suitable climate zones. The major reasons for its invasive behaviour are its fast-growing nature, tolerance to various climate zones and soil types, reported lifespan of over 3,000 years, and its suffocating growth habit as it often begins life as an epiphyte. The Ficus religiosa tree is considered sacred by the followers of Hinduism, Jainism and Buddhism. In the Bhagavad Gita, Krishna says, "I am the Peepul tree among the trees, Narada among the sages, Chitraaratha among the Gandharvas, And sage Kapila among the Siddhas." Gautama Buddha attained enlightenment (bodhi) while meditating underneath a Ficus religiosa. The site is in present-day Bodh Gaya in Bihar, India. The original tree was destroyed, and has been replaced several times. A branch of the original tree was rooted in Anuradhapura, Sri Lanka in 288 BCE and is known as Jaya Sri Maha Bodhi; it is the oldest living human-planted flowering plant (angiosperm) in the world. In Theravada Buddhist Southeast Asia, the tree's massive trunk is often the site of Buddhist or animist shrines. Not all Ficus religiosa can be called a Bodhi Tree. A Bodhi Tree must be able to trace its parent to another Bodhi Tree and the line goes on until the first Bodhi Tree under which Gautama is said to have gained enlightenment. Sadhus (Hindu ascetics) still meditate beneath sacred fig trees, and Hindus do pradakshina (circumambulation, or meditative pacing) around the sacred fig tree as a mark of worship. Usually seven pradakshinas are done around the tree in the morning time chanting "vriksha rajaya namah", meaning "salutation to the king of trees." It claimed that the 27 stars (constellations) constituting 12 houses (rasis) and 9 planets are specifically represented precisely by 27 trees—one for each star. The Bodhi Tree is said to represent Pushya (Western star name γ, δ and θ Cancri in the Cancer constellation). Plaksa is a possible Sanskrit term for Ficus religiosa. However, according to Macdonell and Keith (1912), it denotes the wavy-leaved fig tree (Ficus infectoria) instead. In Hindu texts, the Plaksa tree is associated with the source of the Sarasvati River. The Skanda Purana states that the Sarasvati originates from the water pot of Brahma flows from Plaksa on the Himalayas. According to Vamana Purana 32.1-4, the Sarasvati was rising from the Plaksa tree (Pipal tree). Plaksa Pra-sravana denotes the place where the Sarasvati appears. In the Rigveda Sutras, Plaksa Pra-sravana refers to the source of the Sarasvati. Ficus religiosa is grown by specialty tree plant nurseries for use as an ornamental tree, in gardens and parks in tropical and subtropical climates. Peepul trees are native to Indian subcontinent and thrive in hot, humid weather. They prefer full sunlight and can grow in most soil types, though loam is the best. When planting, use soil with a pH of 7 or below. While it is possible for the plant to grow indoors in a pot, it grows best outside. Young peepul needs proper nourishment. It requires full sunlight and proper watering. Sacred fig occurs naturally in submontane forest regions. 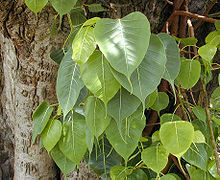 In the Middle East, it is preferably planted as an avenue or road verge tree. In the Philippines and in Nicaragua the species is cultivated in parks and along roadsides and pavements, while in Paraguay it occurs in forests at lower elevations. ^ The Plant List, Ficus religiosa L.
Chisholm, Hugh, ed. (1911). "Peepul" . Encyclopædia Britannica. 21 (11th ed.). Cambridge University Press. p. 45. ^ "Ficus religiosa". Germplasm Resources Information Network (GRIN). Agricultural Research Service (ARS), United States Department of Agriculture (USDA). Retrieved 29 January 2017. ^ "Ficus religiosa — Peepal". Flowers of India. Archived from the original on February 14, 2012. Retrieved November 3, 2011. ^ a b c d e f g h i j "Ficus religiosa (sacred fig tree)". Invasive Species Compendium. CABI. Retrieved 23 July 2018. ^ a b Stephen Forbes (25 December 2016). "The oldest historical tree in the world". medium.com. Medium. Retrieved 23 July 2018. ^ a b c "Ficus religiosa" (PDF). worldagroforestry.org. World Agroforestry Centre. Retrieved 23 July 2018. ^ "The Bhagavad Gita - Chapter 10 - The Yoga of Manifestation". santosha.com. ^ "Rocky Mountain Tree-Ring Research, OLDLIST". Retrieved July 3, 2011. Chisholm, Hugh, ed. (1911). "Bo-Tree" . Encyclopædia Britannica. 4 (11th ed.). Cambridge University Press. p. 305. ^ Damanpreet Singh; Bikram Singh; Rajesh Kumar Goela (April 12, 2011). "Journal of Ethnopharmacology : Traditional uses, phytochemistry and pharmacology of Ficus religiosa: A review". Journal of Ethnopharmacology. ScienceDirect. 134 (3): 565–583. doi:10.1016/j.jep.2011.01.046. PMID 21296646. Archived from the original on February 2, 2013. Wikisource has the text of the 1911 Encyclopædia Britannica article Bo-Tree.